As many of you will know from the recent news headlines, Sally Challen was found guilty of murder in 2011 after striking her husband, Richard Challen, to death with a hammer – after over 30 years of being in an abusive relationship. Since then, the law surrounding both domestic abuse victims and their abusers has dramatically changed, and as such, Sally’s defence team have used this new legislation to appeal to the courts in order to overturn her murder charge or lessen her conviction to manslaughter. After two days of proceedings in The Court of Appeals, Sally’s appeal was successful. There will now be a retrial on the murder of her husband – although she has been denied bail. The new psychiatric evidence presented by Justice for Women and Challen’s lawyer now provides a better understanding of the events leading to Sally’s husband’s death, taking into account the coercive control she experienced over the course of her marriage. 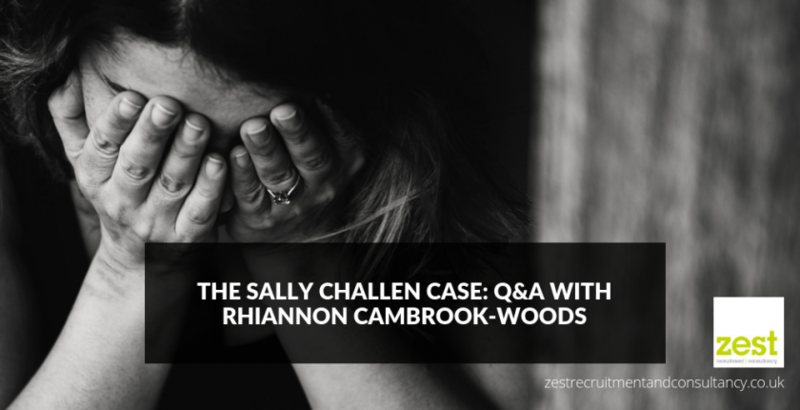 Speaking with our Managing Director, Rhiannon Cambrook-Woods, we explore the what Sally’s future trial could hold from a legal perspective and how it could affect future cases. Q –Whilst we agree that is a landmark case for all those who have suffered the consequences of abusive relationships, what could potentially be the downfall in using the coercive and controlling behaviour as a defence in her retrial? A –Interestingly, in Sally’s case the circumstances surrounding her case happened before the offence of controlling and coercive behaviour came into effect in 2015. In the retrial, coercive control can be attested as motive, but to what extent? That’s what is really going to be under scrutiny in the retrial. Q –Will the actions and evidence of the coercive control prior to this date be admissible in the courts to its full effect? A –The law states that anything before 29thDecember 2015 is not an offence but can be used as bad character evidence, this is where the question lies as if it is allowed and accepted as a significant defence, it starts a domino effect for other cases and could even affect the recently changed law itself. Q –After looking at all media coverage and knowing the law itself, do you have any predictions as to what the potential outcome of the retrial will be? A –It seems there is clear evidence that what Sally endured was unacceptable to say the least, horrific. However, ultimately it is my opinion that a retrial will not see her immediately released, or indeed the sentence lowered. This is not because I don’t acknowledge nor recognise what her and her children endured. The law is hard to change, and if Sally wins her retrial this could have much wider legal implications and cause a chain reaction of similar cases. I’d like to see this case make history and result in a positive outcome – should the evidence be conclusive to manslaughter over murder. Not just for the Challen family and friends, but for all those who have been provoked to defend themselves against their partner’s constant abusive actions. And, whilst this may start of ripple of changes, it could be beneficial for the justice system.